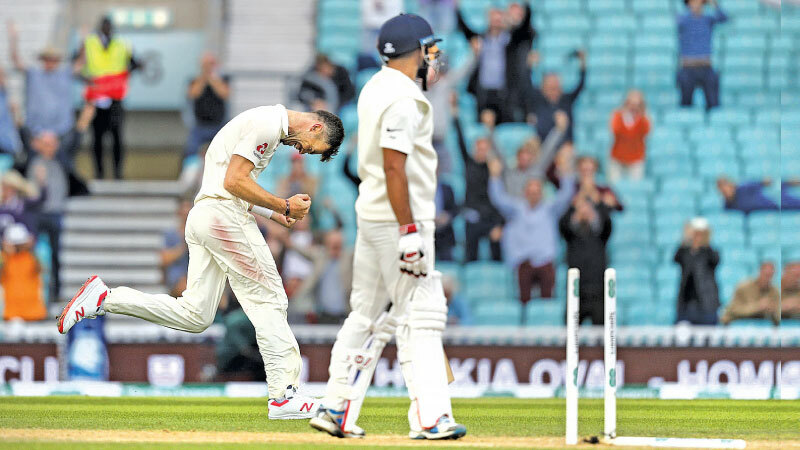 LONDON tuesday: James Anderson became the most successful fast bowler in Test history when he sealed England's 118-run win over India at the Oval on Tuesday. Rahul though clipped his sixth delivery of the day legside for four to complete a fifty -- the first by an India opening batsman this series. But a stand of 118 ended when Rahane (37) miscued a sweep off Moeen Ali to Keaton Jennings at midwicket. India's 120 for four was soon transformed into 121 for five when Ben Stokes had Test debutant Hanuma Vihari, who made 56 in India's first innings, caught behind for a duck. 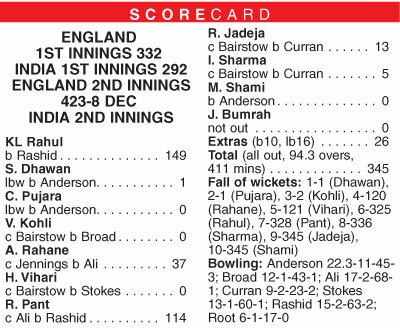 But Rahul slapped Stokes over extra-cover for six to go into the 90s in extraordinary fashion before his top-edged pull for four off the all-rounder took him to 97. And his next over saw Pant, going for another big hit, hole out to Ali at long-off. Anderson was denied the wicket he craved when diving wicket-keeper Jonny Bairstow dropped a low left-handed chance to reprieve Ravindra Jadeja. But Sam Curran struck twice with the new ball when the left-arm paceman had both Ishant Sharma and Jadeja caught behind to leave India on the brink of defeat at 345 for nine. Anderson then gave England the finish they wanted, bowling Shami middle stump. England started Tuesday in a commanding position after Alastair Cook, their all-time leading run-scorer, had marked his last Test before international retirement with 147 in a total of 423 for eight declared on Monday that also included Root's 125.